Gift Set of 3 blue cotton muslins squares beautifully embroidered with baby's name across one corner of each. 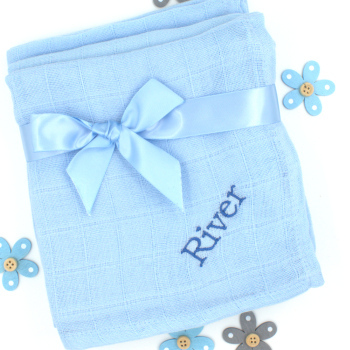 Gift Set of 3 blue cotton muslins squares beautifully embroidered with baby's name across one corner of each. Unique and very useful gift set for mothers and their babies. 100% cotton muslin squares made with a thin breathable weave that makes them easier for fully washing any mess through the fabric. 100% cotton muslin squares made with a thin breathable weave that makes them easier for fully washing any mess through the fabric. Please wash before first use to soften the new cotton fabric. These cotton muslins measure 70 x70cm and are the perfect aid when nursing, feeding and winding baby. It is also common for use inside cloth nappies. We will personalise each muslin square with a name or initials embroidered across the corner in a letter font style and thread colour of your choice.